To reach these goals, you read theory and articles about the concept “self-efficacy, watch a video, carry out tests and assignments, discuss the outcome and cases with peers. To get acquainted with the concept self-efficacy, you need to know what it is and what it is not. Read the text below and the literature recommended in the links. Furthermore we like you to watch a video. The articles and the video should help you to understand the concept of self-efficacy and how you can improve your self-efficacy in given situations. Self-efficacy is the extent or strength of one’s belief in one’s own ability to complete tasks and reach goals. Psychologists have studied self-efficacy from several perspectives, noting various paths in the development of self-efficacy; the dynamics of self-efficacy, and lack thereof, in many different settings; interactions between self-efficacy and self-concept; and habits of attribution that contribute to, or detract from, self-efficacy. This can be seen as the ability to persist and a person’s ability to succeed with a task. As an example, self-efficacy directly relates to how long someone will stick to a workout regimen or a diet. High and low self-efficacy determine whether or not someone will choose to take on a challenging task or “write it off” as impossible. Self-efficacy affects every area of human endeavor. By determining the beliefs a person holds regarding his or her power to affect situations, it strongly influences both the power a person actually has to face challenges competently and the choices a person is most likely to make. These effects are particularly apparent, and compelling, with regard to behaviors affecting health. Read the articles and watch the video to prepare for following assignments. 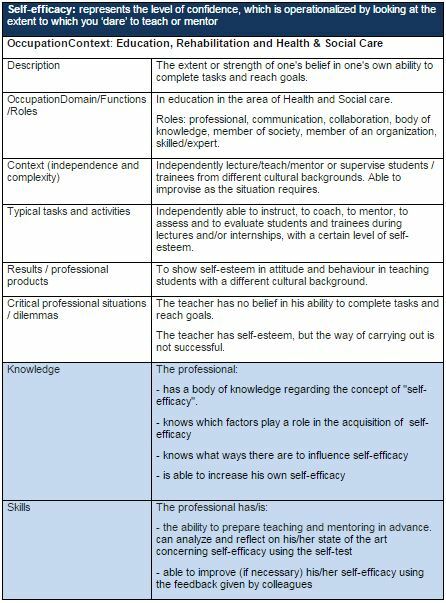 Teacher self-efficacy and teacher burnout: a study of relations. (Only the ‘Discussion’ part.) By Einar M. Skaalvik3. Watch the video: Self-efficacy: It’s role and sources. The assignments mentioned below must give you an insight about your self-efficacy in given situations. Discussing the outcome with peers must lead to a better understanding/awareness about how you perform in a situation and how to improve it. In this module Self-efficacy you have 3 assignments. Describe briefly a situation in which you experienced you were not confident about your way of acting. Why weren’t you comfortable in the situation? What have you done till now to improve your self-efficacy/self-esteem? Videotape at least two presentation and/or lectures you have to give to foreign lecturers or students use the feedback given by your colleagues. Describe briefly your experiences and how you used the feedback. Ask your colleague(-s) (mentioned in 7.2 and 7.3) to give feedback on the videotape of the presentation or lecture (assignment 7.3). Ask them to use the items in the self-test by Ralf Schwarzer & Matthias Jerusalem (1995). What is their opinion about your self-efficacy/esteem? In what way can you use their feedback in the future? Write this down.